Single page found in the backpack. BonDieuBon / a journey through suspension. Bon Dieu Bon (good God good), is a term used widely in Haiti to express hope that despite the present circumstances, somehow things will work out. Bon Dieu Bon is an ongoing collaborative project with Lori Lee, an anthropologist. The original project focused on Haitian emigration to the Virgin Islands and it has progressed to include issues in the Haitian homeland and migration to the Dominican Republic. Immigrants land late at night in areas less exposed to artificial light. They swim to the shore, performing the last stroke of a journey that goes through a series of islands in the Caribbean. Behind some bushes, people are wet, fearful, and maybe disoriented. In that state they will leave, forget, surrender, dispose or lose objects, clothes, letters, products or photos. These objects are the source of an archive that we have created. 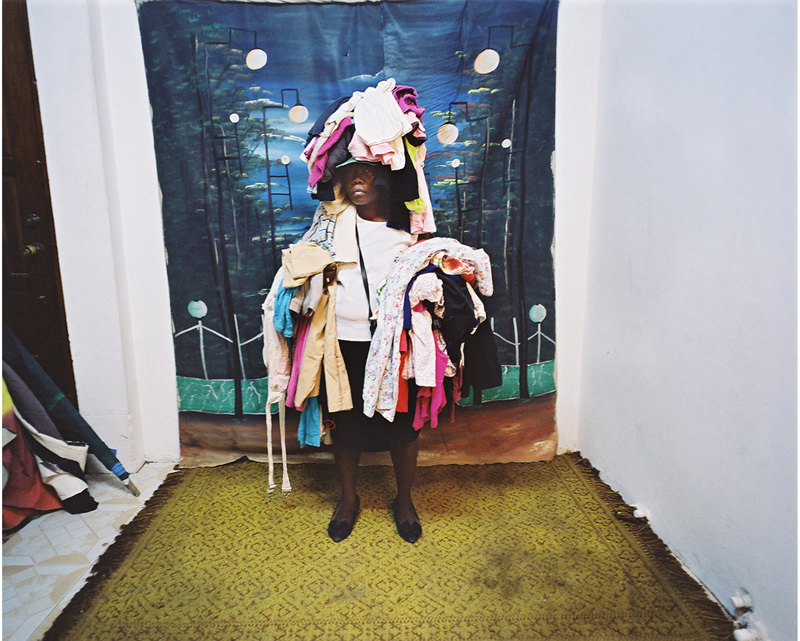 The proposed show deals with Haitian migration based on studio photograph portraits found near the shore or the woods of the US Virgin Islands, specifically on the small island of St. John, where they are thrown aside by the owners while they are running from the migration police. These photographs become physical witnesses as they become transmogrified (distorted and transformed) by the effects of water and they become symbolic witnesses of their identity or others’ identity in transformation. The images are classic portraits taken in photography studios found in Haiti, these studios were almost immediately introduced in Haiti by the French colonial power upon invention in France, and the photographic portrait became a massive expression of self-identity. Painted backgrounds then evolved from realistic scenes to naïf painting depicting ideal landscapes, imaginary constructions of the cities in the Diaspora, and Utopic scenes. An example is the background that depicts a snow scene, this is a direct result of an imagined scene based on the photographs that family members send to Haiti, portraying them in a snow scene in Canada or New York. In that context we understand the photo studio performance as the initiative journey, as the denial of chaotic reality and the active self-construction of their own imaginary and Utopic ideal. The act of the portrait ultimately becomes simultaneously an act of memory, leaving the resulting images to others to remember him or her and imagine his/her future, through this desire of a journey to the landscape painted as background. Ultimately the photographs are an act of resistance, where people take control over there own construction of their identities. The proof of these journeys of transformation is these photos found in the woods and shores of USVI. These images are an index of the journey: the photos are subjected to the migration process, the transformation of the elements—salt water, exposure to the sun and rain—as a metaphor of the transformation of identity, and the psychological effects of the journey. The article BDB::BP::004, is a page taken from a French – English language book. This particular page describes a conversation inside a train—a romanticized version of a trip in a fantasized place far different than the locus of migration. We believe the immigrant imagined his journey in part as the page describes, and it also provided a mental landscape to map out what he encountered. The dialogue on that train, described on the dictionary page, is a dream. It is the active imaginary of another possible landscape—one of many potential alternatives. The backpack contains a letter from Ulysses to his brother. That letter describes the language book Ulysses purchased to learn English. He added that he would send the dictionary to his brother before he embarked to the USA, so his brother could learn English and to later join him in the USA. dream of travel in an airplane……………03…29. The “Tchala” provides concrete realism to the dream. The dream then becomes transformative. The dream is the basic unit to initiate change. Practitioners of vodou believe in the significance of dreams to plan a course of action to resolve problems. The purpose of this book is to use the numbers based on a dream from the night before to play the lottery. In Haiti there is a network of places to play the lottery. They are easily identified because they have the sign “Bank” and are known by the Haitian people as “Bank Borlette”. These borlettes originated during the dictatorship of Francois Duvalier. Duvalier legalized the lottery soon after it was initiated in 1969. It is estimated that Port au Prince is now home to nearly 2,000 borlettes. These institutions are the interstices between dreams and economics. 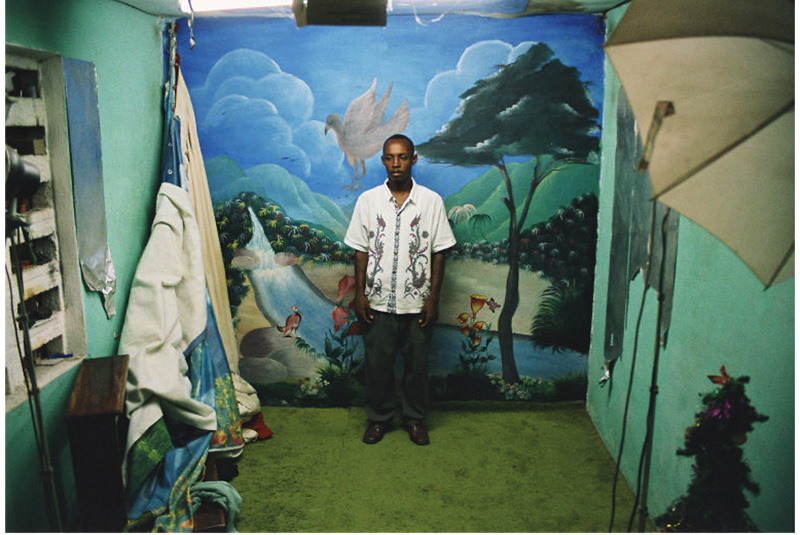 Photo studios in Jacmel Haiti. These photographs become physical witnesses because they become transmogrified images, distorted and transformed by the effects of the water over the emulsion, or they become symbolic witnesses of their identity or others identity in transformation. For this installation we choose to focus specifically on some images left by Haitians and Dominicans upon arrival to St. John that were thrown aside by the owners while they were running from the migration police. 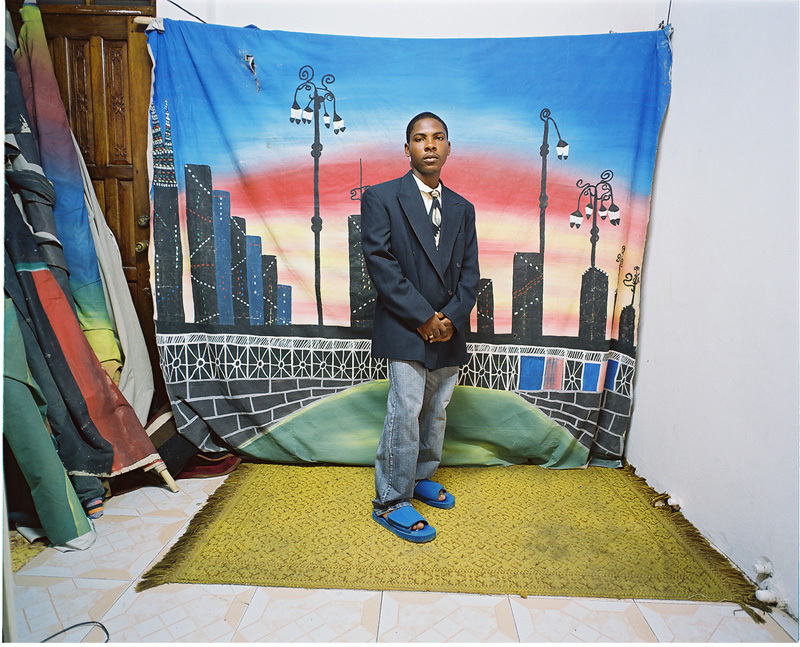 The images are classic portraits taken in photography studios found in Haiti. Painted backgrounds depict ideal landscapes, imaginary constructions of the cities in the Diaspora, and utopic scenes. In that context we understand the photo studio performance as the initiative journey, as the denial of chaotic reality and the active self construction of their own imaginary and utopic ideals. The act of the portrait ultimately becomes simultaneously an act of memory, leaving the resulting images to others to remember him or her and his/her future, through this desire of a journey to the landscape painted as background. The prints (24” x 36”) are photos found in the USVI. The installation works in relation to the trip/journey of the migrant. The studio photos (stills from video) represents the vision of a new landscape, portrayed by the painted background, the beginning of the journey and the construction of a memory, a fictional new geography that exists somewhere in the future. Next is the journey told by the whiteness (described in the video of the map), where the story focuses on the memory of the journey, the embedded process of motion between islands, the journey that transforms memories and images. The proof of this journey of transformation are these photos found in the woods and shores of USVI. These images are an index of the journey: the photos are subjected to the migration process, the transformation of the elements--salt water, exposure to the sun and rain--as a metaphor of the transformation of identity, and the psychological effects of the journey.